A Great White Egret, presumably the bird from Blagdon, and seen briefly here on Friday, made a typically fleeting appearance today, first being located on the mud at Herriott's End, then relocating (out of view) to Herriott's Pool from where it quickly made a stealthy exit and was last seen flying towards Heron's Green Bay. Subsequent efforts to relocate it proved fruitless. At least one Little Gull was on Herriott's Pool again all day; other reports were of one Garganey (far side of Stratford Bay), two Ruff, 11 Ringed Plover, eight Dunlin, one Little Stint, eight Snipe, two Green Sandpipers, eight Black-tailed Godwits, 27 Great Black-backed Gulls, one juvenile Hobby, one juvenile Peregrine and the first Jack Snipe of the autumn - flushed from a net lane in the trapping area. A Pomarine Skua which flew in from the south west, circled and left west this morning was likely the fourth skua species in as many days at Chew. A remarkable turn of events. Other birds at Chew were more run-of-the-mill, with two Little Gulls on Herriott's Pool being the highlight. A few counts made between Herriott's and Heron's Green Bay this afternoon were four Green Sandpipers, two Ruff and 365 Wigeon. The Wigeon count was twice the previous highest September count, and only the fifth for that month in three figures. Four of those counts were in the last ten years, showing that the species has changed to being primarily an autumn migrant rather than a winter visitor. They are taking advantage of summer aquatic weed growth, rather than feeding on vegetation growing on the lake shores as they would have done previously. Unusually a couple of Little Gulls were feeding at Herriott's Pool this afternoon - an adult and this juvenile/first-winter. There's another photo at my Flickr site. No sign of any residual skuas this morning, but there was interest with Chew's seventh Glossy Ibis. 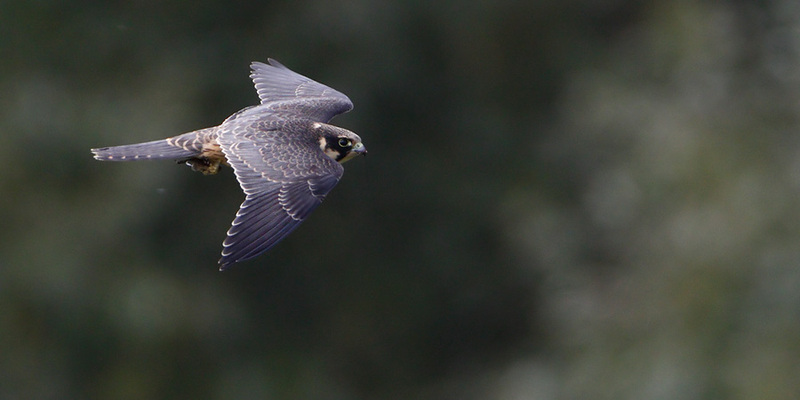 It was seen in flight a few times in the morning, before it relocated to Blagdon, where a Great White Egret had earlier been found. Back at Chew, the regular (so far disappointing) selection of waders and duck was joined by one or two noteworthies - 49 Pintail, 23 Little Egrets - two counts were made of the egrets today - equalling the lake record, the male Ferruginous Duck (Heron's Green Bay), one Black-tailed Godwit, 17 Ringed Plover, five Dunlin, one Green Sandpiper, four Ruff, one Hobby, one Red Kite (W to E low over Stratford hide), nine Yellow-legged Gulls, one Little Gull, one Yellow Wagtail, and a report of a Great White Egret early in the afternoon at Woodford which could not be relocated (after the Blagdon bird had been found). 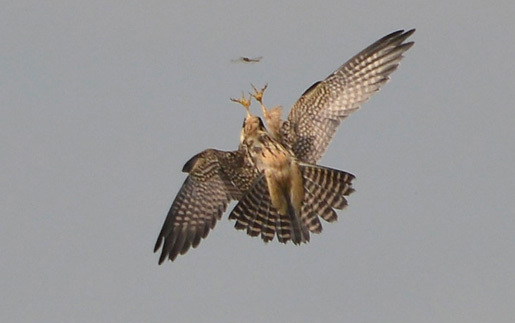 This superb juvenile Hobby spent much of the afternoon between Herriott's Bridge and Sutton Wick hawking dragonflies. You can just see a Migrant Hawker in its talons. A couple more at my Flickr site. Another calm, murky, drizzly day, yet one of the more remarkable days at Chew due to a total of 18 Great Skuas and five or six Arctic Skuas being recorded. Following yesterday's probable Long-tailed, this morning between 10:30 and 11:30, 17 Great Skuas and one Arctic Skua passed through, fairly high over the lake. The Great Skuas were in flocks of five, five and seven. 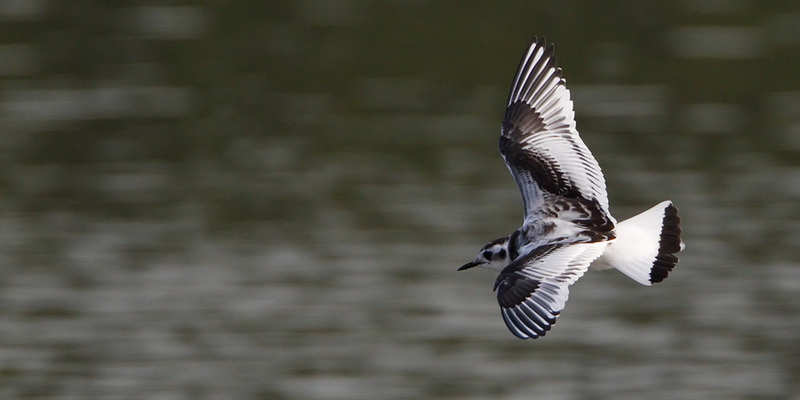 A Little Gull was seen at Stratford Bay, and three Common Terns also arrived and flew immediately west. This afternoon, four adult male Common Scoters were found, along with another Great Skua which spent the afternoon sat on the lake seemingly not knowing what to do with itself. Four or five Arctic Skuas also passed through, with one lingering. One of them was seen to arrive from the NE with five Kittiwakes. Four Common Terns also passed through this afternoon. Potentially the bird of the autumn (so far) slipped past today in the shape of a probable Long-tailed Skua, which appeared from the east at 12:40 and flew off NW. Unfortunately the views obtained in the gloom weren't sufficient to confirm the identification. Waders remain a little thin on the ground, with up to 25 Ringed Plover, two Dunlin, five Ruff, one Greenshank, eight Black-tailed Godwits and a scattering of Snipe. Other birds seen today were two Kingfishers, a light overhead passage of Meadow Pipits, and five early Skylarks over Heron's Green. A dead Water Rail found by the roadside at Herriott's Bridge had been ringed in the nature reserve a few weeks ago; it was a juvenile raised at the lake. Ten Golden Plover flying NW over Moreton/Stratford this afternoon were the first of the autumn; otherwise the only bird of note was the female Ferruginous Duck in Heron's Green Bay still. A Crossbill was seen in flight over Nunnery Point today. Two Little Stints and two Curlew Sandpipers (Herriott's End) were new-in today, with a familiar scattering of the now regular waders still present. Little change, with one or two new birds amongst the usual... one Garganey, one Black-tailed Godwit, two Greenshank, eight Ruff, 19 Ringed Plover, one Little Ringed Plover, 13 Dunlin, one Arctic Tern, one Wheatear, one Hobby and the male 'lesser Scaup' type hybrid. Terns have been pretty woeful at Chew this autumn, so another juvenile Black Tern was noteworthy today, showing uncharacteristically well up and down the shoreline in front of Stratford hide this afternoon. Also from there were the male Ferruginous Duck (in flight), two Black-tailed Godwits, two Greenshank, eight Ruff, four Ringed Plover, the Little Ringed Plover still, seven Dunlin, two Hobbies,, one Peregrine, one Wheatear, and at least 100 Sand Martins amongst thousands of hirundines. Combined counts between Heron's Green Bay and Herriott's today produced up to 59 Snipe, one Little Ringed Plover, eight Ruff, 15 Ringed Plover, nine Dunlin, three Greenshank, 11 Black-tailed Godwits, five Green Sandpipers, one Garganey and a Marsh Harrier. Good numbers of Snipe again; at least 42 between Heron's Green Bay and Herriott's End today. Also seen in the same SW area of the lake were 15 Little Egrets, two Ferruginous Ducks (Heron's Green Bay), 30 Pintail, 157 Wigeon (duck numbers building), 11 Black-tailed Godwits, four Greenshank, seven Ruff, 14 Ringed Plover, seven Dunlin, 11 Green Sandpipers, one Kingfisher and one Hobby. The small wader flock is slowly building, with 13 Ringed Plover and seven Dunlin. A Little Ringed Plover was at Twycross this evening, and at Herriott's End was a Wheatear, seven Ruff and 10 Black-tailed Godwits. Evidently fewer waders around today - no sign of the Little Stint, but still a few of note dotted around - nine Black-tailed Godwits, two Ruff, one Ringed Plover, four Green Sandpipers, two Dunlin and two Greenshank. The male Ferruginous Duck was in Heron's Green Bay still. The Little Stint remained in Heron's Green Bay today, and a Curlew Sandpiper was a new arrival at Herriott's End. Our first Little Stint of the autumn appeared in Heron's Green Bay today - a comparatively plain, cold-looking bird that drew a few hopeful stares this afternoon. Snipe are still in good number - 29 between Herriott's and Heron's Green Bay, with the same section of lake also producing 11 Little Egrets, one Pintail, one Black Tern, six Green Sandpipers, one Common Sandpiper, four Greenshank, four Ruff and 12 Black-tailed Godwits. The one-eyed male Ferruginous Duck was still in Heron's Green Bay this afternoon. Twycross hide produced two Little Ringed Plovers, eight Ringed Plovers and eight Dunlin. Let's hope this isn't where the small wader flock ends up this autumn. Snipe numbers are still pretty good for Chew (although nothing to write home about in national terms) - 30 were counted between Stratford and Herriott's End. One Black Tern and a Garganey were seen from Stratford hide, whilst a Ferruginous Duck was in Heron's Green Bay. Has anyone seen the male and the female at the same time? Ten Black-tailed Godwits and three Ruff were at Herriott's End. The female Ferruginous Duck was still in Heron's Green Bay today, and at least 100 Wigeon were counted in Stratford Bay. Perhaps we might get a continuation in the decent numbers of Wigeon that we had in 2010/11 (last autumn the lake was full so there was no weed growth for them to feed on). A decent count of 14 Little Egrets was made, plus 11 Black-tailed Godwits, three Greenshank, four Ruff, two Green Sandpipers and a Hobby. Five Black Terns were new-in today; other birds seen were one Garganey, four Greenshank, 24 Snipe, five Pintail, 13 Ringed Plover and at least 11 Little Egrets. No sign of the Black-necked Grebe today, but a juvenile Marsh Harrier was seen a few times around midday. Three Curlew and c.12 Common Terns were also on the move. Six Ruff and 15 Black-tailed Godwits were seen from Herriott's Bridge. The male Lesser Scaup-type seen briefly on 29th August was seen again today and identified as a hybrid. Our first Black-necked Grebe of the autumn was in Stratford Bay this evening; also between there an Herriott's End were one Garganey, three-plus Greenshank, five Ringed Plover, seven Green Sandpipers, five Ruff, 10-plus Black-tailed Godwits, one Common Sandpiper and a Hobby. Some good stretches of mud appearing now around the shores, in particular at Herriott's End. Wader totals today as follows: five Common Sandpipers, three Green Sandpipers, seven Snipe, two Dunlin, 18 Lapwing, 14 Black-tailed Godwits, two Greenshank and three Ruff. Another week, another few feet of mud around the lake - most of the waders are at the south end of the lake; today's total including ten Black-tailed Godwits, three Ruff, three Common Sandpipers, three Green Sandpipers, four Snipe, one Greenshank and a Ferruginous Duck.